Proposal Best Practices - The Seibert Group, Inc. The book isn’t available just yet, but it’s close…oh so close. Scroll to the bottom of this page and register to be notified when Proposal Best Practices is released. Discusses the most important and fundamental best practices that sellers should embrace when writing proposals in response to RFPs. Proposal writers and managers, salespeople, subject matter experts, and everyone else involved in the business development effort. Small and midsize businesses who respond to RFPs from schools, state and local government agencies, or from other businesses. An RFP is not a writing project to complete, it’s a sales opportunity to win. Proposal writers need to understand this because, in reality, proposal writers are salespeople who sell on paper. Learn how to write persuasively, how to articulate your strengths vs. competitors, how to improve proposal readability and skimmability, and how to build a compelling message focused on each buyer. If you want your proposals to resonate with buyers, you have to demonstrate how your solution is going to help them, how it's going to solve their problem. 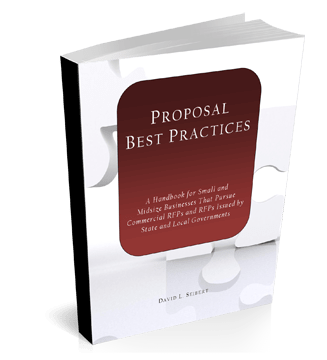 Proposal Best Practices shows you how. If you're serious about improving your win rate, Proposal Best Practices will show you the most fundamental, important best practices to help you accomplish your objective. If you want to win more RFP opportunities, it takes more than good proposals, it takes good business development practices, too. Learn about the best process practices that will help your business to win more business. I wrote this book to give proposal and business development professionals, who work in small and midsize businesses, an informational resource that is right-sized for them and their needs. In Proposal Best Practices, I focus on the most fundamental and most important practices that every seller should implement, regardless of size, and I present these practices in a way that lets you decide how to implement each so it is right-sized for your business. I hope you enjoy it, and I hope you profit from it. Receive a notifcation when the book is released!